All have large image header with all pertinent information front and center. All have motto and logo at top of page as well as basic navigation buttons. Krochet Kids and Teach for Us have similar color schemes with white background. 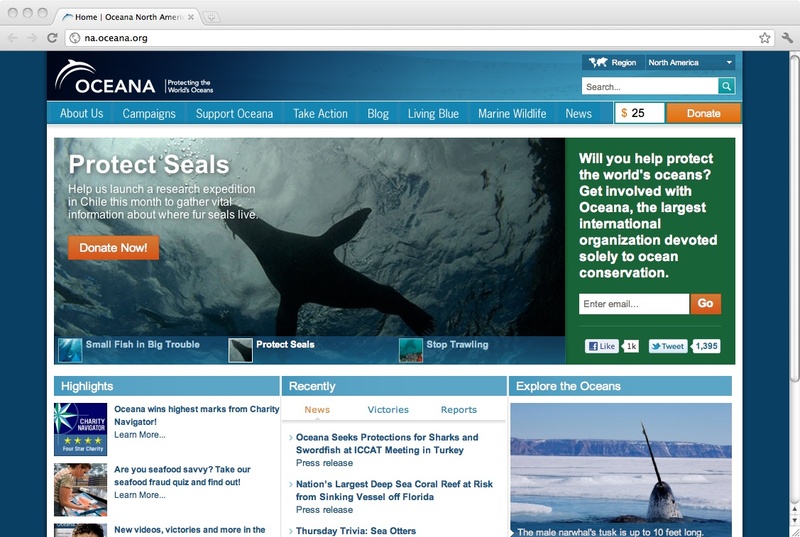 Oceana and Teach for Us have large donate icons, search features, and social media buttons above the fold. Oceana and Krochet Kids image header includes rotating pictures and information. Krochet Kids and Teach for Us format front page content in a blog style. Oceana uses a lot of color including shades of blue and pops of orange. Instead of donations in the traditional sense, Krochet Kids focuses on a “shop for a cause” action for the audience. Krochet Kids utilizes video on the front page. 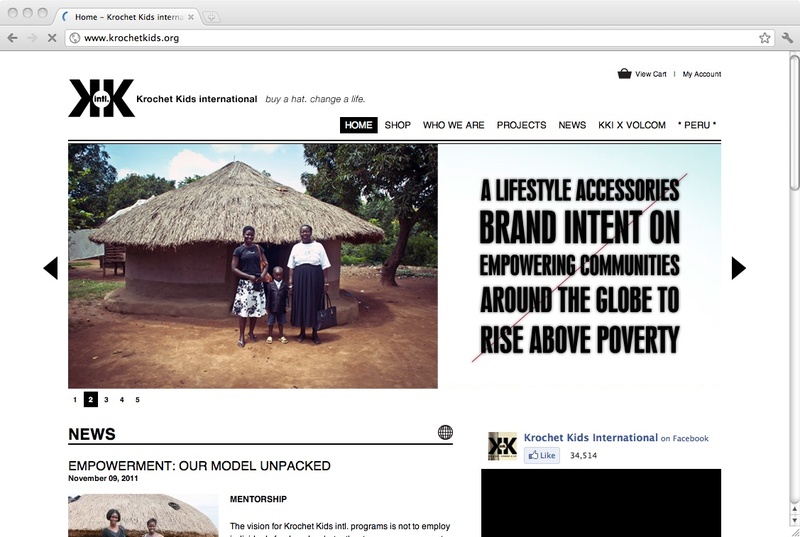 Krochet Kids has the cleanest esthetic with a lot of white space and black text. 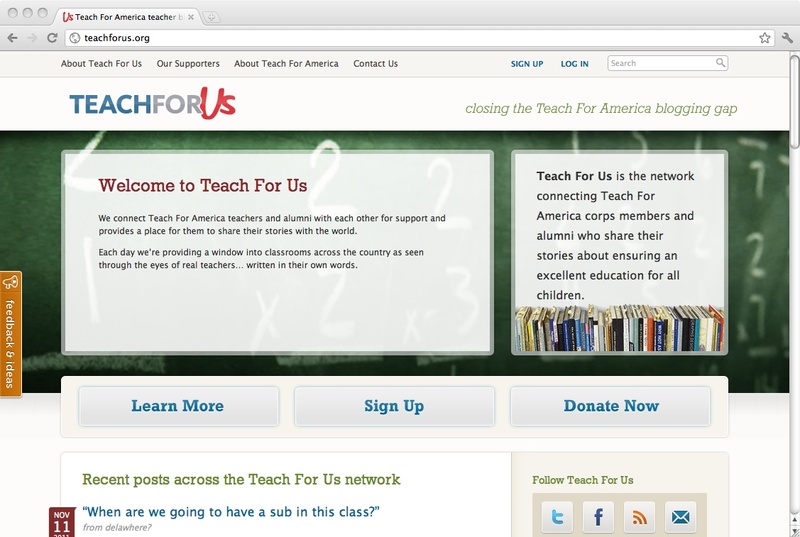 Teach for Us is the only one with a sponsor’s advertisement on the front page. Teach for Us has a fixed Feedback & Ideas button along the vertical left side. Persona: Erica is 34-year-old 8th grade biology teacher at a public school in Delaware. She became interested in biology as a child and followed through with a degree in marine biology from a state university. During her undergraduate years she studied abroad in the “Semester at Sea” program. It was during this semester that she became involved with Oceana’s international volunteer program. Now, as a biology teacher she encourages her students to learn about the current issues surrounding climate change and its effects on the organisms on this planet. During the holiday season each year she makes a generous donation to Oceana. She also promotes a program wherein her students visit classrooms in the elementary school and utilize the Oceana.org website during these presentations to show relevant videos and blog posts from people in the marine biology field. The Principal has asked her to present information to the head of the Science department to possibly include a marine biology course next year at her school. She wants to utilize information gathered from Oceana to prove the worth of such a class. Scenario: In an attempt to build a sample lesson plan on sharks, Erica visits the Oceana website and clicks on the Marine Wildlife tab. Under this section she has access to Marine Wildlife, Marine Places, Marine Science and an IQ quiz. To make the material interesting for young kids, she chooses the Hammerhead shark as her focus because it is native to the Delaware region. Using the search feature under Marine Wildlife she enters the terms “Hammerhead Shark” and comes up with a page full of colorful pictures accompanied by a detailed analysis of this species. Once she copies down the information regarding the Hammerhead, Erica moves on to research marine places specifically the Chesapeake Bay habitat. The Chesapeake Bay page includes basic information and a location map for easy reference. She feels she has enough material for a sample lesson and is happy with the website’s resources. Persona: Phil is a 21-year-old college student whose buddy tells him about a cool nonprofit that involves crocheted hats and other apparel to benefit people in Africa. As a student, Phil doesn’t have a lot of spare cash or time with his full schedule, but has been looking for a way to do good somehow. A few weeks later, Phil remembers his conversation with his buddy as he is trying to brainstorm for a Christmas gift for his girlfriend. He decides to try to find the nonprofit, check out the site, and maybe purchase a gift. He thinks it will be a great way to give back and get some Christmas shopping done. Scenario: Phil Google searches “crocheted hats non-profit” and Krochet Kids comes up as the first search result. He clicks on the link and is taken to the “Our Story” page of Krochet Kids. After reading a little bit about the company he clicks on the “Shop” button to browse the merchandise. He navigates to Women’s headgear and checks out the different hat options. The prices for the hats are similar and he selects the “Hodge Podge” hat as the color (Smoke Blue) goes nicely with his girlfriend’s eyes. He also decides to get something for himself but because of the price he chooses the Assorted Sticker Pack which is only $5. Phil is satisfied with his purchase and recommends the site to his roommate. Persona: Tom is a 25-year-old 6th grade math teacher at a public school in Chicago. He received his English Literature undergraduate degree from a small, liberal arts college in the Northeast. During his undergraduate years he volunteered with many impoverished youth programs in the major metro area around his school. His senior year of college was spent taking extra education courses at the local community college in order to fulfill the application requirements for Teach for America. Upon graduation he received his acceptance into the program and his assignment to one of the lowest rated schools in the Chicago area. During his 2 years teaching at this school he has encountered more problematic students and parents then a majority of seasoned professionals in his field. Connecting with other teachers in impoverished schools systems throughout the country through the Teach for Us website has helped him tremendously in problem solving and curriculum planning. Scenario: Tom is currently dealing with a Hispanic student who doesn’t speak much English and wants tips from other teachers on how best to proceed. As he has used the Teach for Us site before his first instinct is to use the search function for “english language learners”. The search results are not ideal and he can’t find relevant posts so he decides the best method may be creating his own post and soliciting comments. So as the Teach for Us website is a WordPress based platform he can easily create a new post entitled “Help with ESL student” and await other teacher’s comments on his situation. We considered the mission statement and business goals of each nonprofit to determine design effectiveness. Fundraise to provide support for the organizations mission. Design Effectiveness: The site design for fundraising is very effective because the donate button with a suggested amount already entered provides an easy donation process. There are an abundant number of menu options allowing the audience to browse for educational purposes. Strengthen brand awareness and broaden community. Design Effectiveness: “Shop” is the second menu item which proves their paramount goal is to fundraise through sales. The “donation” option is hidden at the bottom of the page and isn’t even listed on the “Get Involved” section of the website. “Buy a hat, change a life” as their motto is reflected in their site design as they focus on the exchange of money for a product rather than donation transactions. The front page is full of information about what their goals are and who they are, it is informative and straightforward. Provide a platform for teachers to connect with each other and reflect on their experiences. Design Effectiveness: The site design is clearly focused on either donations or signing in as a user. The purpose of the site is clear from the front page and it is the only organization with a platform including sign-in functions. The blog style format on the front page provides instant access to support materials for teachers. The red, white, and blue logo color scheme relates to the Teach for America goal. Esthetically beautiful site design with ocean related shades of blue. Several easy to navigate buttons for supporting oceana through volunteerism or donations. An emphasis on education of the audience through a Wikipedia-like Marine Wildlife section. Social media tools are hidden below the fold at the bottom navigation bar. No enticing video implementation on the front page. They have a blog, which could have interesting content, but there is no sample on the front page. As their main focus is on the oceans and ecosystems supported by the oceans it would be helpful to have a world map front and center to illustrate the scope of the organization. Their motto “buy a hat, change a life” explains exactly what their point is and what you should do with this site…buy a hat. Who We Are page includes a lot more important information then some PR blurb about all the good they do. Their Projects page allows you to actually put a face to each of the items for sale and connect with the people behind the purpose. Donate feature is hidden away at the bottom of the front page. Some of the menu bar features have non-descriptive titles, so you actually have to click on them to understand what content lies within that navigation tool. Social media integration is relegated to the bottom of the front page. The shop doesn’t tell you the price of the items as your browse, you have to actually click on an item to see the price. Useful search feature is on the front page above the logo. Social media tools take a central focus on the sidebar of the front page. Recent blog posts also take a central focus as they are featured in brief on the front page. While you can learn about the organization in brief, you have to actually sign up as a teacher to to be able to make a blog post.. The browsing section for different states, regions, grades, or subjects is relegated to the bottom of the front page. Website doesn’t have an appeal to a wide audience, it is almost exclusively for teachers, yet they want/accept donations. Includes an advertisement for a sponsor at the bottom of the page, slightly uncomfortable for the audience even if they are an educational based sponsor. Comprehensive, multiple personas and scenarios. In perfect world, we test all sties with the same scenario (or same sets).